I’m a writer and editor, a journalist, a mom and a wife, a cat-friend and a dog-friend. I’ve had rheumatoid arthritis for almost 28 years, but until I started this blog in 2009, I’d never written about it. I figured it was about time. Just stumbled onto your blog from Rob’s Musings/Distractable Mind blog. Just adore him!! I too have RA since even before diagnosis in 1983 and struggle with it most days. I can empathize with you to the hilt since you describe the facts of RA life to the “T”. I was a nurse (critical care) X 35 yrs. and even rode as a “third” on the fire dept ambulance back where I used to live (MS Gulf Coast and New Orleans). RA made my life pure hell! On top of it came diabetes, small airway disease and heart valve problems. I was 33 at diagnosis. I went from being a nurse to being a patient and afterward only able to work very part time. My savings were spent trying to continue to do it alone. My body habitus changed from the side effects of medications, I got depressed as all get out. Most days I could barely move from bed to toilet without weeping all the way. I met an ER doc several months after diagnosis and we were an item for a while. We had a daughter together but due to many conflicts between us, I left him and returned to MS to live and it was downhill from there. I’ve never fully recovered from the financial downturn, even though I eventually returned to critical care. I could only physically work 2 – 3 shifts per week and barely kept a roof over our heads and food in our bellies. But my daughter and I kept on keeping on. However, try as I might, I could no longer physically handle the job as nursing is extremely hard esp. in ICU where there is always some crisis or other to deal with. I went to home nursing but eventually had to do office work for the agency and was a nurse consultant. Getter sicker and sicker and more and more stressed, I finally was laid off permanently and we went to the edge of poverty and jumped off! After a few years I finally was able to get disability but it’s quite paltry. After Hurricane Katrina, I began to have serious problems – couldn’t bathe or dress myself and I was always sick and went into a terrible depression. I’m not able to live on my own anymore so my daughter, who had moved to Atlanta after her freshman college year, came and moved me to Atlanta with her and her partner. So, here I am, and better for it. I have rallied somewhat since living here – less humidity and slightly cooler air than down on the Gulf – but still need help in many things. They have been just wonderful to me here, and Thank God, my daughter loved me so much she truly wanted to have me live with her and has taken good care of me. She is presently about to finish up a degree in business admin. and will also finish up with an advanced degree in nursing in 3 yrs. or so. She has just started her own concierge service and is doing well in it. She’s my pride and joy! We are also dog and cat folks – 2 of each and all males. I am so very happy and pleased to find your blog and hope we can be online friends. Love your attitude. Just as an aside, I let go my nursing license because it was too expensive to continue and boy, was that one of the biggest mistakes of my life. I have tried 2 yrs. to be re-instated in GA but all to no avail since someone with my degree of disability cannot legally get a GA nursing license. They require me to go back to school in GA since I am not currently licensed in any state, and simply start over!! Even if I could afford it, no nursing school will accept me due to my RA, so I’m screwed. I only wanted to be able to have a current license in order to be able to volunteer my knowledge/skills with an organization or other around here. That, alas, is never going to be and I’m just sick over it. Any chronic illness that renders you too weak or ill or stiff to work 12 hrs. a day will be an obstacle to working in direct healthcare of patients. However, you may want to consider training as a health care records specialist, a coding specialist or billing specialist. This might be a route open to you. Hope to read your blog fairly regularly ( I don’t get online but occasionally) as you have really touched my heart as someone who can tell it like it is regarding RA. Wren: Either I’m losing my mind or you’ve given your blog a new look! Love the color. It’s so bright and fresh. Thank you Wren for sharing your experiences with the rest of us. I never knew about how devastating RA is a until I found out a family friend had RA. I didn’t even know she’s had it for 30 years because she never complained even though she was always in pain. I just thought the things she was going through were diabetes related(?) I guess I just didn’t know and should’ve asked. I think she always tried to hide it. She is now on a natural therapy and her condition has improved dramatically, but it has been quite an experience for me personally to see how RA not only affected her but her entire family. I hope you keep sharing your experiences and educating others. Hi katie, I was wondering what you meant when you said ” she was on a natural therapy, and her condition improved dramatically”? I am sorry to hear of your condition. I don’t know how it feels to suffer from one, but I have lived with someone who did. My wife of nearly 22 years died from an auto-immune condition called Multiple Sclerosis after suffering from it for almost a quarter of a century. I am walking through the entire west coast of Scotland to raise funds for the MS Society in the UK. Please take the time to share my story and encourage others to participate. Hi Karen, Yes, my friend Teri is on a natural therapy that has helped her a lot. I can explain, but it is a little complicated. Feel free to email me katelycho@gmailcom . I came across your article https://rheumatoidarthritis.net/?p=12035 on Facebook. I too have RA/OA and what I provides me relief is dead sea salt bath soaks. My medical massage therapist says that the salts must be dead sea salt and not epsom, as epsom sits on top of the skin whereas the dead sea salts penetrate the skin. I decided to try the baths, at first I did nightly before bedtime for 1/2 hour, then every other night, now to a few times a week. I’m sure it’s different for each person but hopefully this can help provide you relief. Hope you find this to be helpful and that you have more good days than not. First I am sorry for dropping in on your blog like this. I really value your opinion any insight you have will be greatly appreciated. So great to see people blogging and helping each other out in this worldwide autoimmunity epidemic! Please bear with me if you don’t know me… I am not selling anything or taking advantage in any way. I suffered horribly with psoriatic arthritis and other autoimmune issues, but rejected medication and decided to go my own way with it, studying and experimenting for years until I succeeded in reversing it. This book is my story from diagnosis to success with all the crazy wrong turns and magical discoveries that happened in between (with a foreword by well-known neurosurgeon and biohacker Dr. Jack Kruse). I’d like to just let you know that it is FREE on Amazon Kindle for the next three days from the 26th, so if you’d like a copy, go and grab one. I really hope that my story inspires, and if you’d like to leave an honest review, I’d be very grateful. ❤ Hi, I'm a single mom, with RA since I was 19, now I'm 37 …. I also have an italian blog. Hi there- I hope this note finds you well. I’m reaching out to see if you have any interest in learning more about the healing powers of cannabidiol (CBD) and Outch Ointment, a CBD and Chinese herb infused topical, for an article on your blog. From what I’ve seen you haven’t written about CBD, which has been widely reported to improve the quality of life of those suffering from RA, as well as provide a safe, natural alternative to other methods used for chronic pain relief. Would you mind if I sent you some more information? Let me know the best way to reach you if so. 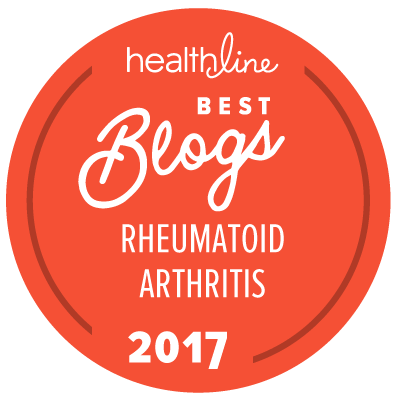 I would like to personally congratulate you as your blog Rheuma has been selected by our panelist as one of the Top 40 Rheumatoid Arthritis Blogs on the web. I personally give you a high-five and want to thank you for your contribution to this world. 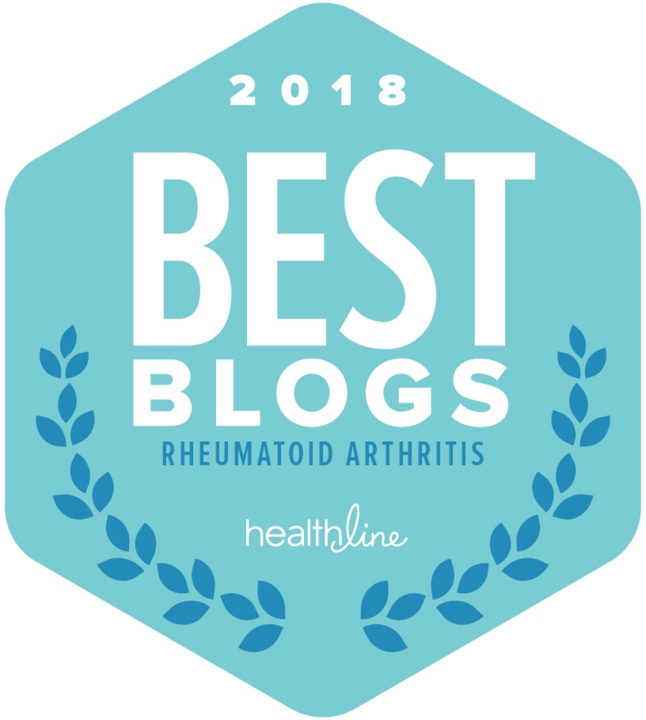 This is the most comprehensive list of Top 40 Rheumatoid Arthritis Blogs on the internet and I’m honored to have you as part of this! I am touched and filled with gratitude that the positivity RA people are sharing. My focus is joint replacement and eliminating the fear. I am an experience RA woman with 40 years + of RA..Still not limping. but, always in pain. Folks with RA know this situation. Too well. My blog is purely to dismiss the fear and hesitation of joint replacement surgery. it is volunteer support only. I happen to be an RN. Also have a Health education degree. My back burner claim is 40 years plus of RA , and 40 years of joint replacement. And the joints DO last. Thank you to all the RA young people and older, muscling through.